Hope you are all having a fabulous and safe long weekend! Last weekend was my best friend's 30th birthday. And I missed it. Missed it! I know what you're thinking, what an awful friend. And to be honest, I felt like that. Unfortunately the transition of companies at my work happened to fall on that weekend and I had a mandatory working weekend alllllll weekend. Luckily, Seth's mom and dad were there to save the day and watch Mason while I was at work which let Seth be able to go to her party. (The party was in San Diego which was why I couldn't just go after work). Seth's dad watched Mason on Saturday after Seth left/before I got home from work and Seth's mom watched Mason on Sunday when I went to work/until Seth got back. On Saturday, I ended up getting off a little earlier than expected and was home around 5pm. I relieved Papa of his Mason-watching duties and he left around 5:30pm-ish. I made us some dinner (aka microwaved) some leftover pizza for Mason and some stir fry and potstickers (that Seth made earlier in the day before he left) for me. Someone decided that my dinner looked better than his and ate every last bite of potsticker on my plate. Looks like we found a new favorite food. After dinner, I thought we would spend some time outside since it was still nice. Mason practically tackled me at the door and wouldn't let me open it, he was so excited to go outside. I told him we were going to play on his water table and he was so excited to see me get the hose out. It might not have been any special occasion, but we had the best time splashing and playing outside and enjoying the beautiful weather. I just love to see my boy so happy, especially about being outside. We played for about 30-45 minutes and then it was bath and bed time. If we can get dinner ready and eaten in enough time each night, I think this may just become our new tradition every night! Sounds like a perfect thing to add to your nightly routine! Noah loves the water too. I like the idea of stripping them down to their diaper! 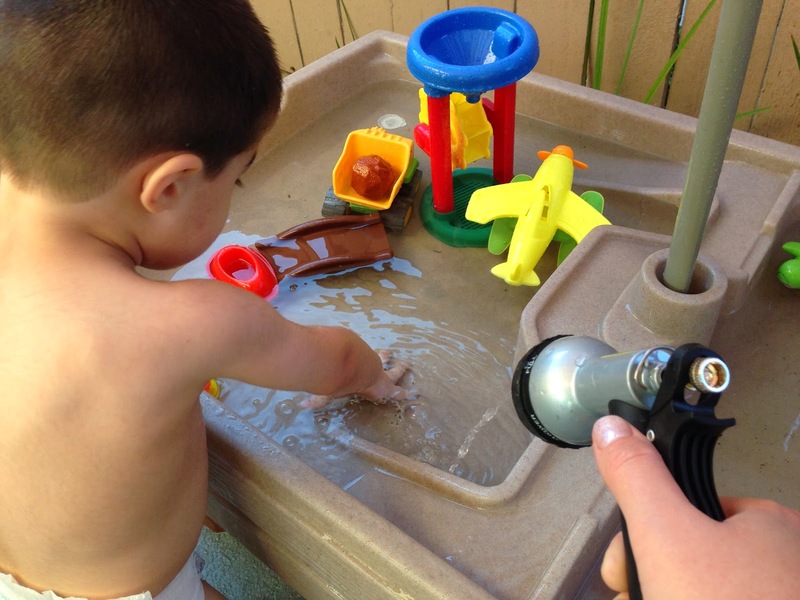 Ooo, I love that water table with the umbrella! 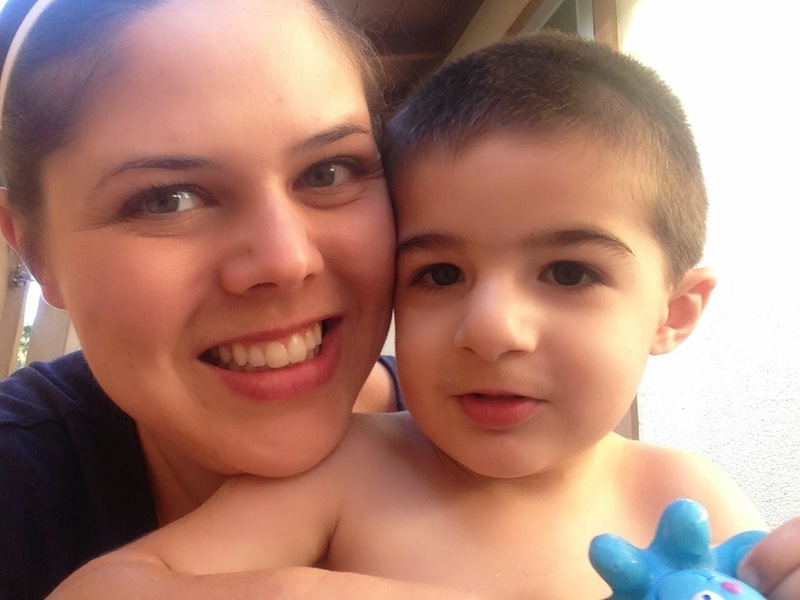 Sounds like you had some great Mommy/son time :) Hope you have a great weekend! Love it ! 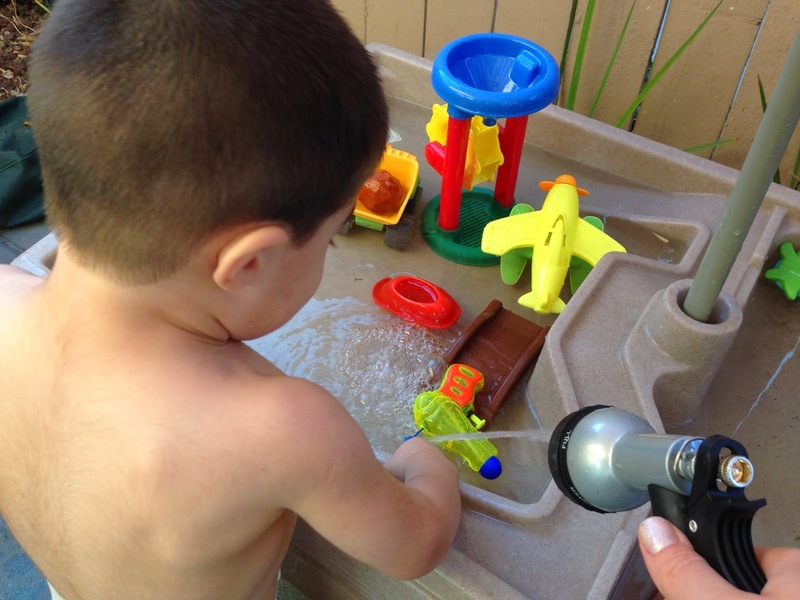 We just got a water table this year and I love it! It's so easy to get out and set up quickly. Oh my goodness! That water table is the bomb! I want one (for myself) haha. I hope you and your family are having a great weekend. Happy 4th of July! 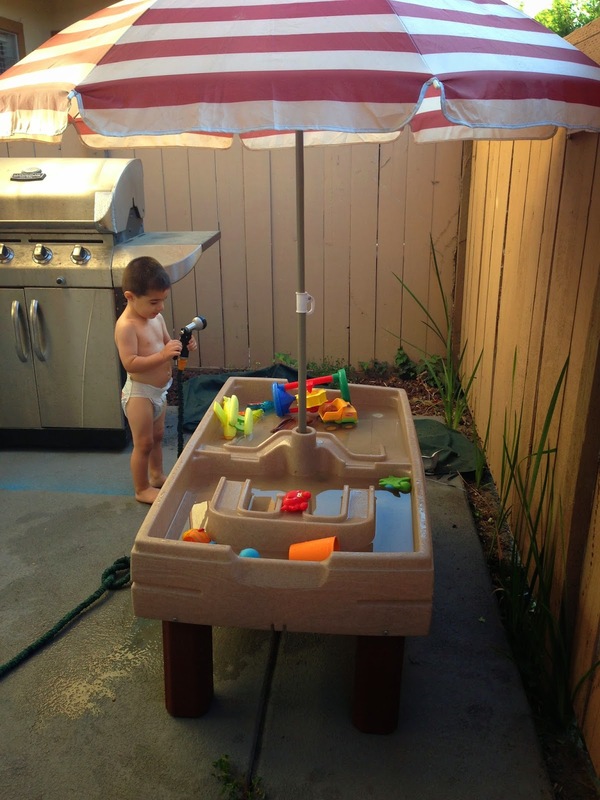 Love that your water table has an umbrella!!! Lily is obsessed with all things water. Bummer you had to work all weekend but yay for new traditions!! haha, I wish I had my act together to go outside and play after dinner! My goal is 6, and that rarely happens. Usually we just hop right in the bath/shower after dinner and get ready for bed. Her bedtime is 8, and yes it takes us that long to get everything done =) I only have one pace, and that is slow. I made a 35 minute meal for dinner and it took me 2 hours. I hope you guys can manage it though, what a great end to the night! 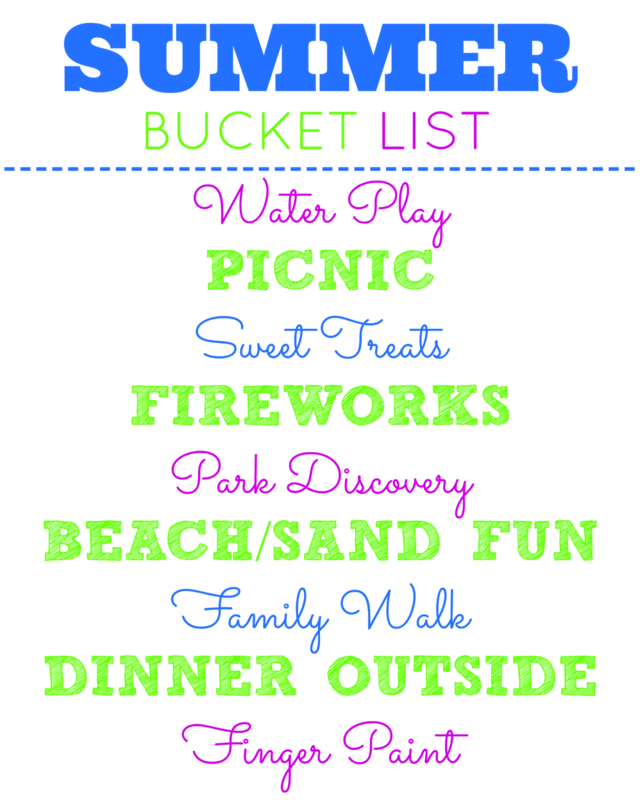 Maybe I can try to get food on the table early enough and join in on the night time fun too. I've been wanting to try my hand at making potstickers! I wonder if Aria would dig them. I've only ever had them out. His hair cut sure makes him look older. A whole new little boy! Was it his first trim or already had a few of those? Is there anything cuter than babies in diapers playing in water? He's adorable! 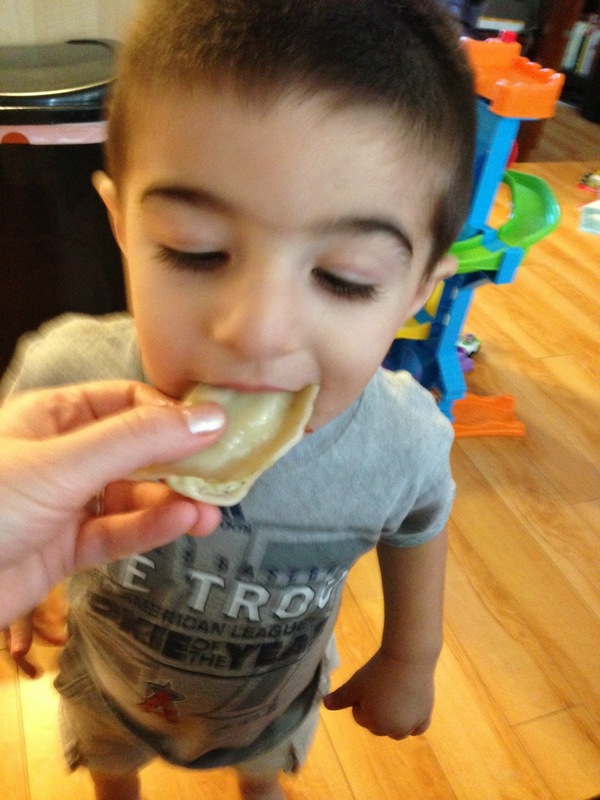 And I'm impressed with the potstickers! I made them for Mac once, but he wouldn't even try them! Sometimes the daily things are the most fun! We haven't played in our water table for quite sometime. I think we need to fill it up and splash away. What a fun, impromptu evening!! 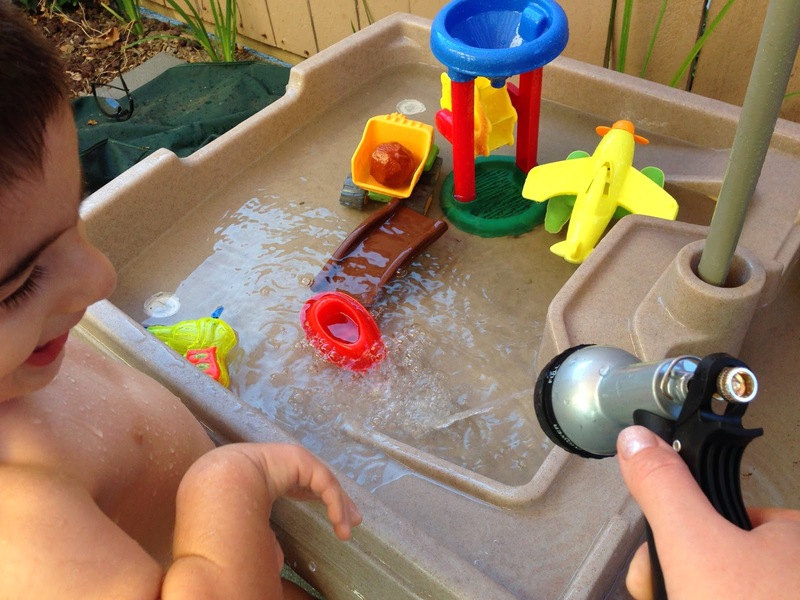 :) That's a super cool water table! !